If you know steel ammo in general, it might be because of this round itself. 5.45x39 ammunition is a proven performer in the standard loadout for the AK-74 variants. The steel behaving particularly well in the Ak’s looser structure and with the aggressive cyclic action. As far as steel rounds go, these are pretty good quality – they rival the original mil-surp that came into the States in the 70’s and 80’s and it offers a good way to play all day with your fun guns on the range. 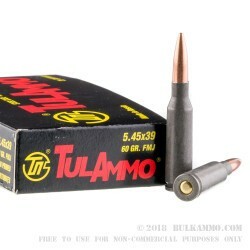 A proven battleground performer, the 5.45x39 is known for the keyholing effect and the ability to send a lot of lead downrange at enemy combatants putting many of them out of commission and causing a lot of other soldiers to pay attention to wounded and mortally wounded fellow soldiers. 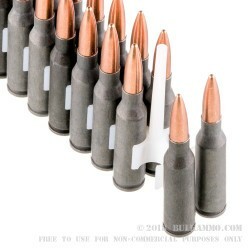 While it wasn’t as effective at killing with a single shot as other rounds, it was known for its prowess in many conflicts and continues as a mainstay in several parts of the world militarily. 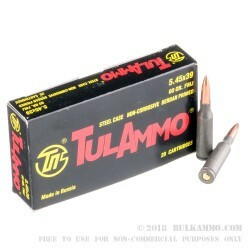 This is TULAMMO’s version of the original steel case, clad 60 grain projectile and it’s been a very good replacement for the, now hard to find military surplus stuff that was so plentiful a decade and a half ago. A perfect target or varmint round: this is a proven loadout. Shoots good with my ar-15 5.56/.223. Smells funny went you shoot it.